Polyadenylation is the addition of a poly(A) tail to a messenger RNA. The poly(A) tail consists of multiple adenosine monophosphates; in other words, it is a stretch of RNA that has only adenine bases. In eukaryotes, polyadenylation is part of the process that produces mature messenger RNA (mRNA) for translation. It, therefore, forms part of the larger process of gene expression. The process of polyadenylation begins as the transcription of a gene terminates. The 3'-most segment of the newly made pre-mRNA is first cleaved off by a set of proteins; these proteins then synthesize the poly(A) tail at the RNA's 3' end. In some genes these proteins add a poly(A) tail at one of several possible sites. Therefore, polyadenylation can produce more than one transcript from a single gene (alternative polyadenylation), similar to alternative splicing. The poly(A) tail is important for the nuclear export, translation, and stability of mRNA. The tail is shortened over time, and, when it is short enough, the mRNA is enzymatically degraded. However, in a few cell types, mRNAs with short poly(A) tails are stored for later activation by re-polyadenylation in the cytosol. In contrast, when polyadenylation occurs in bacteria, it promotes RNA degradation. This is also sometimes the case for eukaryotic non-coding RNAs. mRNA molecules in both prokaryotes and eukaryotes have polyadenylated 3'-ends, with the prokaryotic poly(A) tails generally shorter and less mRNA molecules polyadenylated. Chemical structure of RNA. The sequence of bases differs between RNA molecules. RNAs are a type of large biological molecules, whose individual building blocks are called nucleotides. The name poly(A) tail (for polyadenylic acid tail) reflects the way RNA nucleotides are abbreviated, with a letter for the base the nucleotide contains (A for adenine, C for cytosine, G for guanine and U for uracil). RNAs are produced (transcribed) from a DNA template. By convention, RNA sequences are written in a 5' to 3' direction. The 5' end is the part of the RNA molecule that is transcribed first, and the 3' end is transcribed last. The 3' end is also where the poly(A) tail is found on polyadenylated RNAs. Messenger RNA (mRNA) is RNA that has a coding region that acts as a template for protein synthesis (translation). The rest of the mRNA, the untranslated regions, tune how active the mRNA is. There are also many RNAs that are not translated, called non-coding RNAs. Like the untranslated regions, many of these non-coding RNAs have regulatory roles. In nuclear polyadenylation, a poly(A) tail is added to an RNA at the end of transcription. On mRNAs, the poly(A) tail protects the mRNA molecule from enzymatic degradation in the cytoplasm and aids in transcription termination, export of the mRNA from the nucleus, and translation. Almost all eukaryotic mRNAs are polyadenylated, with the exception of animal replication-dependent histone mRNAs. These are the only mRNAs in eukaryotes that lack a poly(A) tail, ending instead in a stem-loop structure followed by a purine-rich sequence, termed histone downstream element, that directs where the RNA is cut so that the 3' end of the histone mRNA is formed. Many eukaryotic non-coding RNAs are always polyadenylated at the end of transcription. There are small RNAs where the poly(A) tail is seen only in intermediary forms and not in the mature RNA as the ends are removed during processing, the notable ones being microRNAs. But, for many long noncoding RNAs – a seemingly large group of regulatory RNAs that, for example, includes the RNA Xist, which mediates X chromosome inactivation – a poly(A) tail is part of the mature RNA. The processive polyadenylation complex in the nucleus of eukaryotes works on products of RNA polymerase II, such as precursor mRNA. Here, a multi-protein complex (see components on the right) cleaves the 3'-most part of a newly produced RNA and polyadenylates the end produced by this cleavage. The cleavage is catalysed by the enzyme CPSF and occurs 10–30 nucleotides downstream of its binding site. This site often has the polyadenylation signal sequence AAUAAA on the RNA, but variants of it that bind more weakly to CPSF exist. Two other proteins add specificity to the binding to an RNA: CstF and CFI. CstF binds to a GU-rich region further downstream of CPSF's site. CFI recognises a third site on the RNA (a set of UGUAA sequences in mammals) and can recruit CPSF even if the AAUAAA sequence is missing. The polyadenylation signal – the sequence motif recognised by the RNA cleavage complex – varies between groups of eukaryotes. Most human polyadenylation sites contain the AAUAAA sequence, but this sequence is less common in plants and fungi. The RNA is typically cleaved before transcription termination, as CstF also binds to RNA polymerase II. Through a poorly understood mechanism (as of 2002), it signals for RNA polymerase II to slip off of the transcript. Cleavage also involves the protein CFII, though it is unknown how. The cleavage site associated with a polyadenylation signal can vary up to some 50 nucleotides. When the RNA is cleaved, polyadenylation starts, catalysed by polyadenylate polymerase. Polyadenylate polymerase builds the poly(A) tail by adding adenosine monophosphate units from adenosine triphosphate to the RNA, cleaving off pyrophosphate. Another protein, PAB2, binds to the new, short poly(A) tail and increases the affinity of polyadenylate polymerase for the RNA. When the poly(A) tail is approximately 250 nucleotides long the enzyme can no longer bind to CPSF and polyadenylation stops, thus determining the length of the poly(A) tail. CPSF is in contact with RNA polymerase II, allowing it to signal the polymerase to terminate transcription. 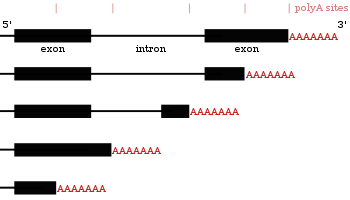 When RNA polymerase II reaches a "termination sequence" (TTATTT on the DNA template and AAUAAA on the primary transcript), the end of transcription is signaled. The polyadenylation machinery is also physically linked to the spliceosome, a complex that removes introns from RNAs. The poly(A) tail acts as the binding site for poly(A)-binding protein. Poly(A)-binding protein promotes export from the nucleus and translation, and inhibits degradation. This protein binds to the poly(A) tail prior to mRNA export from the nucleus and in yeast also recruits poly(A) nuclease, an enzyme that shortens the poly(A) tail and allows the export of the mRNA. Poly(A)-binding protein is exported to the cytoplasm with the RNA. mRNAs that are not exported are degraded by the exosome. Poly(A)-binding protein also can bind to, and thus recruit, several proteins that affect translation, one of these is initiation factor-4G, which in turn recruits the 40S ribosomal subunit. However, a poly(A) tail is not required for the translation of all mRNAs. Further, poly(A) tailing (oligo-adenylation) can determine the fate of RNA molecules that are usually not poly(A)-tailed (such as (small) non-coding (sn)RNAs etc.) and thereby induce their RNA decay. In eukaryotic somatic cells, the poly(A) tail of most mRNAs in the cytoplasm gradually get shorter, and mRNAs with shorter poly(A) tail are translated less and degraded sooner. However, it can take many hours before an mRNA is degraded. This deadenylation and degradation process can be accelerated by microRNAs complementary to the 3' untranslated region of an mRNA. In immature egg cells, mRNAs with shortened poly(A) tails are not degraded, but are instead stored without being translated. They are then activated by cytoplasmic polyadenylation after fertilisation, during egg activation. In animals, poly(A) ribonuclease (PARN) can bind to the 5' cap and remove nucleotides from the poly(A) tail. The level of access to the 5' cap and poly(A) tail is important in controlling how soon the mRNA is degraded. PARN deadenylates less if the RNA is bound by the initiation factors 4E (at the 5' cap) and 4G (at the poly(A) tail), which is why translation reduces deadenylation. The rate of deadenylation may also be regulated by RNA-binding proteins. Once the poly(A) tail is removed, the decapping complex removes the 5' cap, leading to a degradation of the RNA. Several other enzymes that seem to be involved in deadenylation have been identified in yeast. Many protein-coding genes have more than one polyadenylation site, so a gene can code for several mRNAs that differ in their 3' end. Since alternative polyadenylation changes the length of the 3' untranslated region, it can change which binding sites for microRNAs the 3' untranslated region contains. MicroRNAs tend to repress translation and promote degradation of the mRNAs they bind to, although there are examples of microRNAs that stabilise transcripts. Alternative polyadenylation can also shorten the coding region, thus making the mRNA code for a different protein, but this is much less common than just shortening the 3' untranslated region. The choice of poly(A) site can be influenced by extracellular stimuli and depends on the expression of the proteins that take part in polyadenylation. For example, the expression of CstF-64, a subunit of cleavage stimulatory factor (CstF), increases in macrophages in response to lipopolysaccharides (a group of bacterial compounds that trigger an immune response). This results in the selection of weak poly(A) sites and thus shorter transcripts. This removes regulatory elements in the 3' untranslated regions of mRNAs for defense-related products like lysozyme and TNF-α. These mRNAs then have longer half-lives and produce more of these proteins. RNA-binding proteins other than those in the polyadenylation machinery can also affect whether a polyadenyation site is used, as can DNA methylation near the polyadenylation signal. There is polyadenylation in the cytosol of some animal cell types, namely in the germ line, during early embryogenesis and in post-synaptic sites of nerve cells. This lengthens the poly(A) tail of an mRNA with a shortened poly(A) tail, so that the mRNA will be translated. These shortened poly(A) tails are often less than 20 nucleotides, and are lengthened to around 80–150 nucleotides. In the early mouse embryo, cytoplasmic polyadenylation of maternal RNAs from the egg cell allows the cell to survive and grow even though transcription does not start until the middle of the 2-cell stage (4-cell stage in human). In the brain, cytoplasmic polyadenylation is active during learning and could play a role in long-term potentiation, which is the strengthening of the signal transmission from a nerve cell to another in response to nerve impulses and is important for learning and memory formation. Cytoplasmic polyadenylation requires the RNA-binding proteins CPSF and CPEB, and can involve other RNA-binding proteins like Pumilio. Depending on the cell type, the polymerase can be the same type of polyadenylate polymerase (PAP) that is used in the nuclear process, or the cytoplasmic polymerase GLD-2. For many non-coding RNAs, including tRNA, rRNA, snRNA, and snoRNA, polyadenylation is a way of marking the RNA for degradation, at least in yeast. This polyadenylation is done in the nucleus by the TRAMP complex, which maintains a tail that is around 4 nucleotides long to the 3' end. The RNA is then degraded by the exosome. Poly(A) tails have also been found on human rRNA fragments, both the form of homopolymeric (A only) and heterpolymeric (mostly A) tails. In many bacteria, both mRNAs and non-coding RNAs can be polyadenylated. This poly(A) tail promotes degradation by the degradosome, which contains two RNA-degrading enzymes: polynucleotide phosphorylase and RNase E. Polynucleotide phosphorylase binds to the 3' end of RNAs and the 3' extension provided by the poly(A) tail allows it to bind to the RNAs whose secondary structure would otherwise block the 3' end. Successive rounds of polyadenylation and degradation of the 3' end by polynucleotide phosphorylase allows the degradosome to overcome these secondary structures. The poly(A) tail can also recruit RNases that cut the RNA in two. These bacterial poly(A) tails are about 30 nucleotides long. In as different groups as animals and trypanosomes, the mitochondria contain both stabilising and destabilising poly(A) tails. Destabilising polyadenylation targets both mRNA and noncoding RNAs. The poly(A) tails are 43 nucleotides long on average. The stabilising ones start at the stop codon, and without them the stop codon (UAA) is not complete as the genome only encodes the U or UA part. Plant mitochondria have only destabilising polyadenylation, and yeast mitochondria have no polyadenylation at all. While many bacteria and mitochondria have polyadenylate polymerases, they also have another type of polyadenylation, performed by polynucleotide phosphorylase itself. This enzyme is found in bacteria, mitochondria, plastids and as a constituent of the archaeal exosome (in those archaea that have an exosome). It can synthesise a 3' extension where the vast majority of the bases are adenines. Like in bacteria, polyadenylation by polynucleotide phosphorylase promotes degradation of the RNA in plastids and likely also archaea. Although polyadenylation is seen in almost all organisms, it is not universal. However, the wide distribution of this modification and the fact that it is present in organisms from all three domains of life implies that the last universal common ancestor of all living organisms, it is presumed, had some form of polyadenylation system. A few organisms do not polyadenylate mRNA, which implies that they have lost their polyadenylation machineries during evolution. Although no examples of eukaryotes that lack polyadenylation are known, mRNAs from the bacterium Mycoplasma gallisepticum and the salt-tolerant archaean Haloferax volcanii lack this modification. The most ancient polyadenylating enzyme is polynucleotide phosphorylase. This enzyme is part of both the bacterial degradosome and the archaeal exosome, two closely related complexes that recycle RNA into nucleotides. This enzyme degrades RNA by attacking the bond between the 3'-most nucleotides with a phosphate, breaking off a diphosphate nucleotide. This reaction is reversible, and so the enzyme can also extend RNA with more nucleotides. The heteropolymeric tail added by polynucleotide phosphorylase is very rich in adenine. The choice of adenine is most likely the result of higher ADP concentrations than other nucleotides as a result of using ATP as an energy currency, making it more likely to be incorporated in this tail in early lifeforms. It has been suggested that the involvement of adenine-rich tails in RNA degradation prompted the later evolution of polyadenylate polymerases (the enzymes that produce poly(A) tails with no other nucleotides in them). Polyadenylate polymerases are not as ancient. They have separately evolved in both bacteria and eukaryotes from CCA-adding enzyme, which is the enzyme that completes the 3' ends of tRNAs. Its catalytic domain is homologous to that of other polymerases. It is presumed that the horizontal transfer of bacterial CCA-adding enzyme to eukaryotes allowed the archaeal-like CCA-adding enzyme to switch function to a poly(A) polymerase. Some lineages, like archaea and cyanobacteria, never evolved a polyadenylate polymerase. Poly(A)polymerase was first identified in 1960 as an enzymatic activity in extracts made from cell nuclei that could polymerise ATP, but not ADP, into polyadenine. Although identified in many types of cells, this activity had no known function until 1971, when poly(A) sequences were found in mRNAs. The only function of these sequences was thought at first to be protection of the 3' end of the RNA from nucleases, but later the specific roles of polyadenylation in nuclear export and translation were identified. The polymerases responsible for polyadenylation were first purified and characterized in the 1960s and 1970s, but the large number of accessory proteins that control this process were discovered only in the early 1990s. ^ a b Proudfoot, Nick J.; Furger, Andre; Dye, Michael J. (2002). "Integrating mRNA Processing with Transcription". Cell. 108 (4): 501–12. doi:10.1016/S0092-8674(02)00617-7. PMID 11909521. ^ a b Guhaniyogi, J; Brewer, G (2001). "Regulation of mRNA stability in mammalian cells". Gene. 265 (1–2): 11–23. doi:10.1016/S0378-1119(01)00350-X. PMC 3340483. PMID 11255003. ^ a b c Richter, Joel D. (1999). "Cytoplasmic Polyadenylation in Development and Beyond". Microbiology and Molecular Biology Reviews. 63 (2): 446–56. PMC 98972. PMID 10357857. ^ Steege, Deborah A. (2000). "Emerging features of mRNA decay in bacteria". RNA. 6 (8): 1079–90. doi:10.1017/S1355838200001023. PMC 1369983. PMID 10943888. ^ Zhuang, Yunyun; Zhang, Huan; Lin, Senjie (2013). "Polyadenylation of 18S rRNA in algae". Journal of Phycology. 49 (3): 570–579. doi:10.1111/jpy.12068. PMID 27007045. ^ Anderson, James T. (2005). "RNA Turnover: Unexpected Consequences of Being Tailed". Current Biology. 15 (16): R635–8. doi:10.1016/j.cub.2005.08.002. PMID 16111937. ^ a b Sarkar, Nilima (June 1997). "Polyadenylation of mRNA in Prokaryotes". Annual Review of Biochemistry. 66 (1): 173–197. doi:10.1146/annurev.biochem.66.1.173. PMID 9242905. ^ Stevens, A (1963). "Ribonucleic Acids-Biosynthesis and Degradation". Annual Review of Biochemistry. 32: 15–42. doi:10.1146/annurev.bi.32.070163.000311. PMID 14140701. ^ Abaza, I.; Gebauer, F. (2008). "Trading translation with RNA-binding proteins". RNA. 14 (3): 404–9. doi:10.1261/rna.848208. PMC 2248257. PMID 18212021. ^ Mattick, J. S.; Makunin, I. V. (2006). "Non-coding RNA". Human Molecular Genetics. 15 (90001): R17–29. doi:10.1093/hmg/ddl046. PMID 16651366. ^ a b Hunt, Arthur G; Xu, Ruqiang; Addepalli, Balasubrahmanyam; Rao, Suryadevara; Forbes, Kevin P; Meeks, Lisa R; Xing, Denghui; Mo, Min; Zhao, Hongwei; Bandyopadhyay, Amrita; Dampanaboina, Lavanya; Marion, Amanda; von Lanken, Carol; Li, Qingshun (2008). "Arabidopsis mRNA polyadenylation machinery: comprehensive analysis of protein-protein interactions and gene expression profiling". BMC Genomics. 9: 220. doi:10.1186/1471-2164-9-220. PMC 2391170. PMID 18479511. ^ a b Davila Lopez, M.; Samuelsson, T. (2007). "Early evolution of histone mRNA 3' end processing". RNA. 14 (1): 1–10. doi:10.1261/rna.782308. PMC 2151031. PMID 17998288. ^ Marzluff, William F.; Gongidi, Preetam; Woods, Keith R.; Jin, Jianping; Maltais, Lois J. (2002). "The Human and Mouse Replication-Dependent Histone Genes". Genomics. 80 (5): 487–98. doi:10.1016/S0888-7543(02)96850-3. PMID 12408966. ^ Saini, H. K.; Griffiths-Jones, S.; Enright, A. J. (2007). "Genomic analysis of human microRNA transcripts". Proceedings of the National Academy of Sciences. 104 (45): 17719–24. Bibcode:2007PNAS..10417719S. doi:10.1073/pnas.0703890104. PMC 2077053. PMID 17965236. ^ Yoshikawa, M.; Peragine, A; Park, M. Y.; Poethig, R. S. (2005). "A pathway for the biogenesis of trans-acting siRNAs in Arabidopsis". Genes & Development. 19 (18): 2164–75. doi:10.1101/gad.1352605. PMC 1221887. PMID 16131612. ^ Amaral, Paulo P.; Mattick, John S. (2008). "Noncoding RNA in development". Mammalian Genome. 19 (7–8): 454–92. doi:10.1007/s00335-008-9136-7. PMID 18839252. ^ a b c d Bienroth, S; Keller, W; Wahle, E (February 1993). "Assembly of a processive messenger RNA polyadenylation complex". The EMBO Journal. 12 (2): 585–594. doi:10.1002/j.1460-2075.1993.tb05690.x. PMC 413241. PMID 8440247. ^ a b Liu, D.; Brockman, J. M.; Dass, B.; Hutchins, L. N.; Singh, P.; McCarrey, J. R.; MacDonald, C. C.; Graber, J. H. (2006). "Systematic variation in mRNA 3'-processing signals during mouse spermatogenesis". Nucleic Acids Research. 35 (1): 234–46. doi:10.1093/nar/gkl919. PMC 1802579. PMID 17158511. ^ Lutz, Carol S. (2008). "Alternative Polyadenylation: A Twist on mRNA 3′ End Formation". ACS Chemical Biology. 3 (10): 609–17. doi:10.1021/cb800138w. PMID 18817380. ^ a b Beaudoing, E.; Freier, S; Wyatt, JR; Claverie, JM; Gautheret, D (2000). "Patterns of Variant Polyadenylation Signal Usage in Human Genes". Genome Research. 10 (7): 1001–10. doi:10.1101/gr.10.7.1001. PMC 310884. PMID 10899149. ^ Brown, Kirk M; Gilmartin, Gregory M (2003). "A Mechanism for the Regulation of Pre-mRNA 3′ Processing by Human Cleavage Factor Im". Molecular Cell. 12 (6): 1467–76. doi:10.1016/S1097-2765(03)00453-2. PMID 14690600. ^ Yang, Q.; Gilmartin, G. M.; Doublie, S. (2010). "Structural basis of UGUA recognition by the Nudix protein CFIm25 and implications for a regulatory role in mRNA 3' processing". Proceedings of the National Academy of Sciences. 107 (22): 10062–7. Bibcode:2010PNAS..10710062Y. doi:10.1073/pnas.1000848107. PMC 2890493. PMID 20479262. ^ Yang, Qin; Coseno, Molly; Gilmartin, Gregory M.; Doublié, Sylvie (2011). "Crystal Structure of a Human Cleavage Factor CFIm25/CFIm68/RNA Complex Provides an Insight into Poly(A) Site Recognition and RNA Looping". Structure. 19 (3): 368–77. doi:10.1016/j.str.2010.12.021. PMC 3056899. PMID 21295486. ^ Venkataraman, K.; Brown, K. M.; Gilmartin, G. M. (2005). "Analysis of a noncanonical poly(A) site reveals a tripartite mechanism for vertebrate poly(A) site recognition". Genes & Development. 19 (11): 1315–27. doi:10.1101/gad.1298605. PMC 1142555. PMID 15937220. ^ a b Millevoi, Stefania; Loulergue, Clarisse; Dettwiler, Sabine; Karaa, Sarah Zeïneb; Keller, Walter; Antoniou, Michael; Vagner, StéPhan (2006). "An interaction between U2AF 65 and CF Im links the splicing and 3′ end processing machineries". The EMBO Journal. 25 (20): 4854–64. doi:10.1038/sj.emboj.7601331. PMC 1618107. PMID 17024186. ^ a b c Shen, Y.; Ji, G.; Haas, B. J.; Wu, X.; Zheng, J.; Reese, G. J.; Li, Q. Q. (2008). "Genome level analysis of rice mRNA 3'-end processing signals and alternative polyadenylation". Nucleic Acids Research. 36 (9): 3150–61. doi:10.1093/nar/gkn158. PMC 2396415. PMID 18411206. ^ Glover-Cutter, Kira; Kim, Soojin; Espinosa, Joaquin; Bentley, David L (2007). "RNA polymerase II pauses and associates with pre-mRNA processing factors at both ends of genes". Nature Structural & Molecular Biology. 15 (1): 71–8. doi:10.1038/nsmb1352. PMC 2836588. PMID 18157150. ^ Molecular Biology of the Cell, Chapter 6, "From DNA to RNA". 4th edition. Alberts B, Johnson A, Lewis J, et al. New York: Garland Science; 2002. ^ Stumpf, G.; Domdey, H. (1996). "Dependence of Yeast Pre-mRNA 3'-End Processing on CFT1: A Sequence Homolog of the Mammalian AAUAAA Binding Factor". Science. 274 (5292): 1517–20. Bibcode:1996Sci...274.1517S. doi:10.1126/science.274.5292.1517. PMID 8929410. ^ Iseli, C.; Stevenson, B. J.; De Souza, S. J.; Samaia, H. B.; Camargo, A. A.; Buetow, K. H.; Strausberg, R. L.; Simpson, A. J.G. ; et al. (2002). "Long-Range Heterogeneity at the 3' Ends of Human mRNAs". Genome Research. 12 (7): 1068–74. doi:10.1101/gr.62002. PMC 186619. PMID 12097343. ^ Balbo, Paul B.; Bohm, Andrew (2007). "Mechanism of Poly(A) Polymerase: Structure of the Enzyme-MgATP-RNA Ternary Complex and Kinetic Analysis". Structure. 15 (9): 1117–31. doi:10.1016/j.str.2007.07.010. PMC 2032019. PMID 17850751. ^ Viphakone, N.; Voisinet-Hakil, F.; Minvielle-Sebastia, L. (2008). "Molecular dissection of mRNA poly(A) tail length control in yeast". Nucleic Acids Research. 36 (7): 2418–33. doi:10.1093/nar/gkn080. PMC 2367721. PMID 18304944. ^ Wahle, Elmar (1995). "Poly(A) Tail Length Control Is Caused by Termination of Processive Synthesis". Journal of Biological Chemistry. 270 (6): 2800–8. doi:10.1074/jbc.270.6.2800. PMID 7852352. ^ Dichtl, B.; Blank, D; Sadowski, M; Hübner, W; Weiser, S; Keller, W (2002). "Yhh1p/Cft1p directly links poly(A) site recognition and RNA polymerase II transcription termination". The EMBO Journal. 21 (15): 4125–35. doi:10.1093/emboj/cdf390. PMC 126137. PMID 12145212. ^ Nag, Anita; Narsinh, Kazim; Martinson, Harold G (2007). "The poly(A)-dependent transcriptional pause is mediated by CPSF acting on the body of the polymerase". Nature Structural & Molecular Biology. 14 (7): 662–9. doi:10.1038/nsmb1253. PMID 17572685. ^ Ayalew Tefferi; Wieben, Eric D.; Dewald, Gordon W.; Whiteman, David A.H.; Bernard, Matthew E.; Spelsberg, Thomas C. (August 31, 2002). "Primer on medical genomics part II: Background principles and methods in molecular genetics". Mayo Clinic Proceedings. 77 (8): 785–808. doi:10.4065/77.8.785. PMID 12173714. ^ Coller, J. M.; Gray, N. K.; Wickens, M. P. (1998). "mRNA stabilization by poly(A) binding protein is independent of poly(A) and requires translation". Genes & Development. 12 (20): 3226–35. doi:10.1101/gad.12.20.3226. PMC 317214. PMID 9784497. ^ a b Siddiqui, N.; Mangus, D. A.; Chang, T.-C.; Palermino, J.-M.; Shyu, A.-B. ; Gehring, K. (2007). "Poly(A) Nuclease Interacts with the C-terminal Domain of Polyadenylate-binding Protein Domain from Poly(A)-binding Protein". Journal of Biological Chemistry. 282 (34): 25067–75. doi:10.1074/jbc.M701256200. PMID 17595167. ^ Vinciguerra, Patrizia; Stutz, FrançOise (2004). "mRNA export: an assembly line from genes to nuclear pores". Current Opinion in Cell Biology. 16 (3): 285–92. doi:10.1016/j.ceb.2004.03.013. PMID 15145353. ^ Gray, N. K.; Coller, JM; Dickson, KS; Wickens, M (2000). "Multiple portions of poly(A)-binding protein stimulate translation in vivo". The EMBO Journal. 19 (17): 4723–33. doi:10.1093/emboj/19.17.4723. PMC 302064. PMID 10970864. ^ Meaux, S.; Van Hoof, A (2006). "Yeast transcripts cleaved by an internal ribozyme provide new insight into the role of the cap and poly(A) tail in translation and mRNA decay". RNA. 12 (7): 1323–37. doi:10.1261/rna.46306. PMC 1484436. PMID 16714281. ^ Kargapolova, Y.; Levin, M.; Lackner, K.; Danckwardt, S. (2017). "sCLIP — an integrated platform to study RNA–protein interactomes in biomedical research: identification of CSTF2tau in alternative processing of small nuclear RNAs". Nucleic Acids Res. 45 (10): 6074–6086. doi:10.1093/nar/gkx152. PMC 5449641. PMID 28334977. ^ a b Meijer, H. A.; Bushell, M.; Hill, K.; Gant, T. W.; Willis, A. E.; Jones, P.; De Moor, C. H. (2007). "A novel method for poly(A) fractionation reveals a large population of mRNAs with a short poly(A) tail in mammalian cells". Nucleic Acids Research. 35 (19): e132. doi:10.1093/nar/gkm830. PMC 2095794. PMID 17933768. ^ Lehner, B.; Sanderson, CM (2004). "A Protein Interaction Framework for Human mRNA Degradation". Genome Research. 14 (7): 1315–23. doi:10.1101/gr.2122004. PMC 442147. PMID 15231747. ^ Wu, L.; Fan, J.; Belasco, J. G. (2006). "From the Cover: MicroRNAs direct rapid deadenylation of mRNA". Proceedings of the National Academy of Sciences. 103 (11): 4034–9. Bibcode:2006PNAS..103.4034W. doi:10.1073/pnas.0510928103. PMC 1449641. PMID 16495412. ^ Cui, J.; Sackton, K. L.; Horner, V. L.; Kumar, K. E.; Wolfner, M. F. (2008). "Wispy, the Drosophila Homolog of GLD-2, Is Required During Oogenesis and Egg Activation". Genetics. 178 (4): 2017–29. doi:10.1534/genetics.107.084558. PMC 2323793. PMID 18430932. ^ Wilusz, Carol J.; Wormington, Michael; Peltz, Stuart W. (2001). "The cap-to-tail guide to mRNA turnover". Nature Reviews Molecular Cell Biology. 2 (4): 237–46. doi:10.1038/35067025. PMID 11283721. ^ Tian, B.; Hu, J; Zhang, H; Lutz, CS (2005). "A large-scale analysis of mRNA polyadenylation of human and mouse genes". Nucleic Acids Research. 33 (1): 201–12. doi:10.1093/nar/gki158. PMC 546146. PMID 15647503. ^ Danckwardt, Sven; Hentze, Matthias W; Kulozik, Andreas E (2008). "3′ end mRNA processing: molecular mechanisms and implications for health and disease". The EMBO Journal. 27 (3): 482–98. doi:10.1038/sj.emboj.7601932. PMC 2241648. PMID 18256699. ^ Sandberg, R.; Neilson, J. R.; Sarma, A.; Sharp, P. A.; Burge, C. B. (2008). "Proliferating Cells Express mRNAs with Shortened 3' Untranslated Regions and Fewer MicroRNA Target Sites". Science. 320 (5883): 1643–7. Bibcode:2008Sci...320.1643S. doi:10.1126/science.1155390. PMC 2587246. PMID 18566288. ^ Tili, Esmerina; Michaille, Jean-Jacques; Calin, George Adrian (2008). "Expression and function of micro-RNAs in immune cells during normal or disease state". International Journal of Medical Sciences. 5 (2): 73–9. doi:10.7150/ijms.5.73. PMC 2288788. PMID 18392144. ^ Ghosh, T.; Soni, K.; Scaria, V.; Halimani, M.; Bhattacharjee, C.; Pillai, B. (2008). "MicroRNA-mediated up-regulation of an alternatively polyadenylated variant of the mouse cytoplasmic -actin gene". Nucleic Acids Research. 36 (19): 6318–32. doi:10.1093/nar/gkn624. PMC 2577349. PMID 18835850. ^ Alt, F; Bothwell, AL; Knapp, M; Siden, E; Mather, E; Koshland, M; Baltimore, D (1980). "Synthesis of secreted and membrane-bound immunoglobulin mu heavy chains is directed by mRNAs that differ at their 3′ ends". Cell. 20 (2): 293–301. doi:10.1016/0092-8674(80)90615-7. PMID 6771018. ^ Tian, B.; Pan, Z.; Lee, J. Y. (2007). "Widespread mRNA polyadenylation events in introns indicate dynamic interplay between polyadenylation and splicing". Genome Research. 17 (2): 156–65. doi:10.1101/gr.5532707. PMC 1781347. PMID 17210931. ^ a b Shell, S. A.; Hesse, C; Morris Jr, SM; Milcarek, C (2005). "Elevated Levels of the 64-kDa Cleavage Stimulatory Factor (CstF-64) in Lipopolysaccharide-stimulated Macrophages Influence Gene Expression and Induce Alternative Poly(A) Site Selection". Journal of Biological Chemistry. 280 (48): 39950–61. doi:10.1074/jbc.M508848200. PMID 16207706. ^ Ogorodnikov A, Levin M, Tattikota S, Tokalov S, Hoque M, Scherzinger D, Marini F, Poetsch A, Binder H, Macher-Göppinger S, Probst HC, Tian B, Schaefer M, Lackner KJ, Westermann F, Danckwardt S (December 2018). "Transcriptome 3'end organization by PCF11 links alternative polyadenylation to formation and neuronal differentiation of neuroblastoma". Nat. Commun. 9 (1): 5331. doi:10.1038/s41467-018-07580-5. PMID 30552333. ^ Licatalosi, Donny D.; Mele, Aldo; Fak, John J.; Ule, Jernej; Kayikci, Melis; Chi, Sung Wook; Clark, Tyson A.; Schweitzer, Anthony C.; et al. (2008). "HITS-CLIP yields genome-wide insights into brain alternative RNA processing". Nature. 456 (7221): 464–9. Bibcode:2008Natur.456..464L. doi:10.1038/nature07488. PMC 2597294. PMID 18978773. ^ Hall-Pogar, T.; Liang, S.; Hague, L. K.; Lutz, C. S. (2007). "Specific trans-acting proteins interact with auxiliary RNA polyadenylation elements in the COX-2 3'-UTR". RNA. 13 (7): 1103–15. doi:10.1261/rna.577707. PMC 1894925. PMID 17507659. ^ Danckwardt, Sven; Kaufmann, Isabelle; Gentzel, Marc; Foerstner, Konrad U; Gantzert, Anne-Susan; Gehring, Niels H; Neu-Yilik, Gabriele; Bork, Peer; et al. (2007). "Splicing factors stimulate polyadenylation via USEs at non-canonical 3′ end formation signals". The EMBO Journal. 26 (11): 2658–69. doi:10.1038/sj.emboj.7601699. PMC 1888663. PMID 17464285. ^ Danckwardt, Sven; Gantzert, Anne-Susan; Macher-Goeppinger, Stephan; Probst, Hans Christian; Gentzel, Marc; Wilm, Matthias; Gröne, Hermann-Josef; Schirmacher, Peter; et al. (2011). "p38 MAPK Controls Prothrombin Expression by Regulated RNA 3′ End Processing". Molecular Cell. 41 (3): 298–310. doi:10.1016/j.molcel.2010.12.032. PMID 21292162. ^ Wood, A. J.; Schulz, R.; Woodfine, K.; Koltowska, K.; Beechey, C. V.; Peters, J.; Bourc'his, D.; Oakey, R. J. (2008). "Regulation of alternative polyadenylation by genomic imprinting" (PDF). Genes & Development. 22 (9): 1141–6. doi:10.1101/gad.473408. PMC 2335310. PMID 18451104. ^ Jung, M.-Y. ; Lorenz, L.; Richter, J. D. (2006). "Translational Control by Neuroguidin, a Eukaryotic Initiation Factor 4E and CPEB Binding Protein". Molecular and Cellular Biology. 26 (11): 4277–87. doi:10.1128/MCB.02470-05. PMC 1489097. PMID 16705177. ^ Sakurai, Takayuki; Sato, Masahiro; Kimura, Minoru (2005). "Diverse patterns of poly(A) tail elongation and shortening of murine maternal mRNAs from fully grown oocyte to 2-cell embryo stages". Biochemical and Biophysical Research Communications. 336 (4): 1181–9. doi:10.1016/j.bbrc.2005.08.250. PMID 16169522. ^ Taft, R (2008). "Virtues and limitations of the preimplantation mouse embryo as a model system". Theriogenology. 69 (1): 10–6. doi:10.1016/j.theriogenology.2007.09.032. PMC 2239213. PMID 18023855. ^ Richter, J (2007). "CPEB: a life in translation". Trends in Biochemical Sciences. 32 (6): 279–85. doi:10.1016/j.tibs.2007.04.004. PMID 17481902. ^ Piqué, Maria; López, José Manuel; Foissac, Sylvain; Guigó, Roderic; Méndez, Raúl (2008). "A Combinatorial Code for CPE-Mediated Translational Control". Cell. 132 (3): 434–48. doi:10.1016/j.cell.2007.12.038. PMID 18267074. ^ Benoit, P.; Papin, C.; Kwak, J. E.; Wickens, M.; Simonelig, M. (2008). "PAP- and GLD-2-type poly(A) polymerases are required sequentially in cytoplasmic polyadenylation and oogenesis in Drosophila". Development. 135 (11): 1969–79. doi:10.1242/dev.021444. PMID 18434412. ^ Reinisch, Karin M; Wolin, Sandra L (2007). "Emerging themes in non-coding RNA quality control". Current Opinion in Structural Biology. 17 (2): 209–14. doi:10.1016/j.sbi.2007.03.012. PMID 17395456. ^ Jia, Huijue; Wang, Xuying; Liu, Fei; Guenther, Ulf-Peter; Srinivasan, Sukanya; Anderson, James T.; Jankowsky, Eckhard (June 2011). "The RNA Helicase Mtr4p Modulates Polyadenylation in the TRAMP Complex". Cell. 145 (6): 890–901. doi:10.1016/j.cell.2011.05.010. PMC 3115544. PMID 21663793. Retrieved 16 December 2014. ^ Lacava, John; Houseley, Jonathan; Saveanu, Cosmin; Petfalski, Elisabeth; Thompson, Elizabeth; Jacquier, Alain; Tollervey, David (2005). "RNA Degradation by the Exosome Is Promoted by a Nuclear Polyadenylation Complex". Cell. 121 (5): 713–24. doi:10.1016/j.cell.2005.04.029. PMID 15935758. ^ a b Martin, G.; Keller, W. (2007). "RNA-specific ribonucleotidyl transferases". RNA. 13 (11): 1834–49. doi:10.1261/rna.652807. PMC 2040100. PMID 17872511. ^ Slomovic, S.; Laufer, D; Geiger, D; Schuster, G (2006). "Polyadenylation of ribosomal RNA in human cells". Nucleic Acids Research. 34 (10): 2966–75. doi:10.1093/nar/gkl357. PMC 1474067. PMID 16738135. ^ Régnier, Philippe; Arraiano, Cecília Maria (2000). "Degradation of mRNA in bacteria: emergence of ubiquitous features". BioEssays. 22 (3): 235–44. doi:10.1002/(SICI)1521-1878(200003)22:3<235::AID-BIES5>3.0.CO;2-2. PMID 10684583. ^ a b c Anantharaman, V.; Koonin, EV; Aravind, L (2002). "Comparative genomics and evolution of proteins involved in RNA metabolism". Nucleic Acids Research. 30 (7): 1427–64. doi:10.1093/nar/30.7.1427. PMC 101826. PMID 11917006. ^ a b Slomovic, Shimyn; Portnoy, Victoria; Liveanu, Varda; Schuster, Gadi (2006). "RNA Polyadenylation in Prokaryotes and Organelles; Different Tails Tell Different Tales". Critical Reviews in Plant Sciences. 25: 65–77. doi:10.1080/07352680500391337. ^ Chang, S. A.; Cozad, M.; MacKie, G. A.; Jones, G. H. (2007). "Kinetics of Polynucleotide Phosphorylase: Comparison of Enzymes from Streptomyces and Escherichia coli and Effects of Nucleoside Diphosphates". Journal of Bacteriology. 190 (1): 98–106. doi:10.1128/JB.00327-07. PMC 2223728. PMID 17965156. ^ Nagaike, T; Suzuki, T; Ueda, T (2008). "Polyadenylation in mammalian mitochondria: Insights from recent studies". Biochimica et Biophysica Acta (BBA) - Gene Regulatory Mechanisms. 1779 (4): 266–9. doi:10.1016/j.bbagrm.2008.02.001. PMID 18312863. ^ Walter, M.; Kilian, J; Kudla, J (2002). "PNPase activity determines the efficiency of mRNA 3'-end processing, the degradation of tRNA and the extent of polyadenylation in chloroplasts". The EMBO Journal. 21 (24): 6905–14. doi:10.1093/emboj/cdf686. PMC 139106. PMID 12486011. ^ Portnoy, V.; Schuster, G. (2006). "RNA polyadenylation and degradation in different Archaea; roles of the exosome and RNase R". Nucleic Acids Research. 34 (20): 5923–31. doi:10.1093/nar/gkl763. PMC 1635327. PMID 17065466. ^ Yehudai-Resheff, S.; Portnoy, V; Yogev, S; Adir, N; Schuster, G (2003). "Domain Analysis of the Chloroplast Polynucleotide Phosphorylase Reveals Discrete Functions in RNA Degradation, Polyadenylation, and Sequence Homology with Exosome Proteins". The Plant Cell Online. 15 (9): 2003–19. doi:10.1105/tpc.013326. PMC 181327. PMID 12953107. ^ Slomovic, S; Portnoy, V; Schuster, G (2008). RNA Turnover in Prokaryotes, Archaea and Organelles: Chapter 24 Detection and Characterization of Polyadenylated RNA in Eukarya, Bacteria, Archaea, and Organelles. Methods in Enzymology. 447. pp. 501–20. doi:10.1016/S0076-6879(08)02224-6. ISBN 978-0-12-374377-0. PMID 19161858. ^ Portnoy, Victoria; Evguenieva-Hackenberg, Elena; Klein, Franziska; Walter, Pamela; Lorentzen, Esben; Klug, Gabriele; Schuster, Gadi (2005). "RNA polyadenylation in Archaea: not observed in Haloferax while the exosome polynucleotidylates RNA in Sulfolobus". EMBO Reports. 6 (12): 1188–93. doi:10.1038/sj.embor.7400571. PMC 1369208. PMID 16282984. ^ Portnoy, Victoria; Schuster, Gadi (2008). "Mycoplasma gallisepticum as the first analyzed bacterium in which RNA is not polyadenylated". FEMS Microbiology Letters. 283 (1): 97–103. doi:10.1111/j.1574-6968.2008.01157.x. PMID 18399989. ^ Evguenieva-Hackenberg, Elena; Roppelt, Verena; Finsterseifer, Pamela; Klug, Gabriele (2008). "Rrp4 and Csl4 Are Needed for Efficient Degradation but Not for Polyadenylation of Synthetic and Natural RNA by the Archaeal Exosome†". Biochemistry. 47 (50): 13158–68. doi:10.1021/bi8012214. PMID 19053279. ^ a b Slomovic, S; Portnoy, V; Yehudairesheff, S; Bronshtein, E; Schuster, G (2008). "Polynucleotide phosphorylase and the archaeal exosome as poly(A)-polymerases". Biochimica et Biophysica Acta (BBA) - Gene Regulatory Mechanisms. 1779 (4): 247–55. doi:10.1016/j.bbagrm.2007.12.004. PMID 18177749. ^ Edmonds, Mary; Abrams, Richard (1960). "Polynucleotide Biosynthesis: Formation of a Sequence of Adenylate Units from Adenosine Triphosphate by an Enzyme from Thymus Nuclei". The Journal of Biological Chemistry. 235 (4): 1142–9. PMID 13819354. ^ Colgan, D. F.; Manley, J. L. (1997). "Mechanism and regulation of mRNA polyadenylation". Genes & Development. 11 (21): 2755–66. doi:10.1101/gad.11.21.2755. ^ a b Edmonds, M (2002). A history of poly A sequences: from formation to factors to function. Progress in Nucleic Acid Research and Molecular Biology. 71. pp. 285–389. doi:10.1016/S0079-6603(02)71046-5. ISBN 978-0-12-540071-8. PMID 12102557. ^ Edmonds, M.; Vaughan, M. H.; Nakazato, H. (1971). "Polyadenylic Acid Sequences in the Heterogeneous Nuclear RNA and Rapidly-Labeled Polyribosomal RNA of HeLa cells: Possible Evidence for a Precursor Relationship". Proceedings of the National Academy of Sciences. 68 (6): 1336–40. Bibcode:1971PNAS...68.1336E. doi:10.1073/pnas.68.6.1336. PMC 389184. PMID 5288383. Danckwardt, Sven; Hentze, Matthias W; Kulozik, Andreas E (2008). "3′ end mRNA processing: molecular mechanisms and implications for health and disease". The EMBO Journal. 27 (3): 482–98. doi:10.1038/sj.emboj.7601932. PMC 2241648. PMID 18256699. Wikimedia Commons has media related to Polyadenylation.